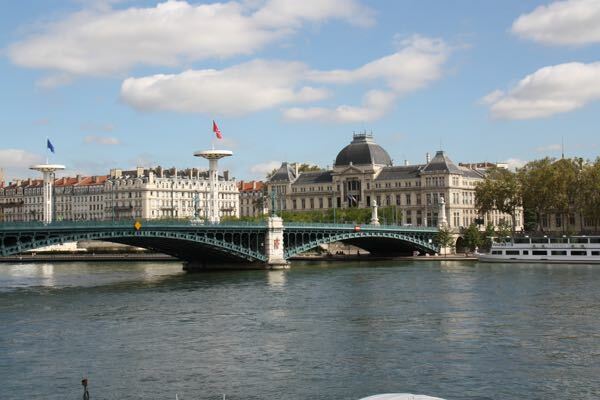 You’re in a foreign city, like Paris, sitting alone or with your friend/spouse/significant other (fill in the blank) discussing the day’s siteseeing in your native language. You exchange pleasantries with your server or diners beside you using a few foreign words or phrases such as, “Il fait beau” (It is beautiful/sunny out) or “Le poulet, s’il vous plaît” (The chicken, please). Two hours pass, you pay your bill and leave. You’re in a foreign city, sitting in a Parisian home which is beautifully decorated. You are conversing in English and maybe a smattering of French with your 2 Parisian hosts and 4 other guests who happen to work in Paris. You’re learning about the French towns where some of the guests grew up in and about the work that they do in Paris. 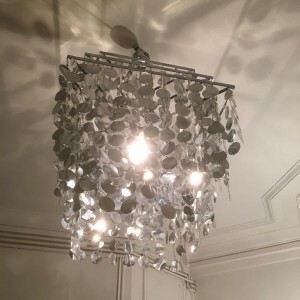 Your French is OK (or non-existent) but you make the effort to have a conversation and your hosts (and other guests) speak English to make you feel more comfortable. Red wine and hor d’oeuvres of homemade paté are served along with slices of baguette, cornichons (small pickles) and olives. This was the beginning of a very unique experience I had compliments of VizEat, a meal-sharing platform that has expanded through Europe and is represented with over 3000 hosts in France alone. 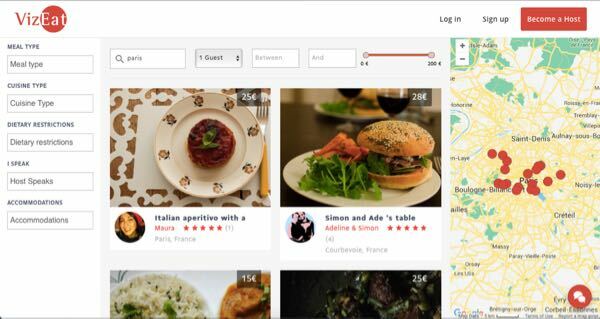 Think of it as the foodie side of Airbnb or Uber, where the hosts are amateurs who create original meals. But the hosts don’t just cook and leave the guests on their own. They share the meal with them. Guests book a meal after doing a search on the VizEat website (available in 4 languages: English, French, Italian, and Spanish). 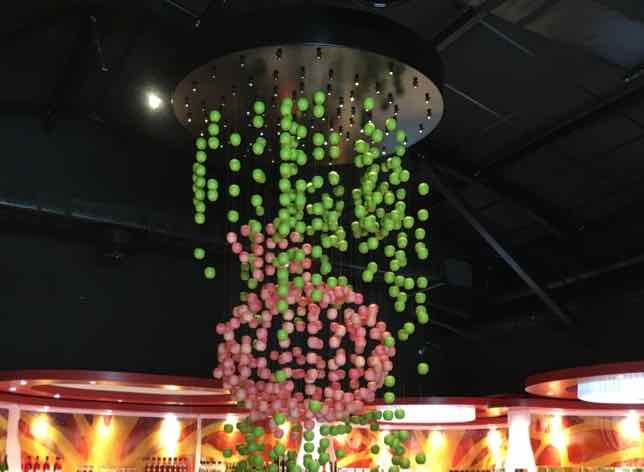 They choose the type of food they’d like, the price range they’d prefer, and the area where the dining experience will take place. On the website there is information about the host, the meal and reviews from former guests. I met co-founder Camille Rumani last year in Spain at TBEX (Travel Bloggers Exchange) and she and Jean-Michel Petit have expanded their business to become the European leaders in the social-dining platform in France, Italy, and Spain. There are now 50,000 members and 10,000 hosts in over 65 countries. I was intrigued to learn about a growing interest by locals and travellers looking for authentic experiences—something one would truly remember. 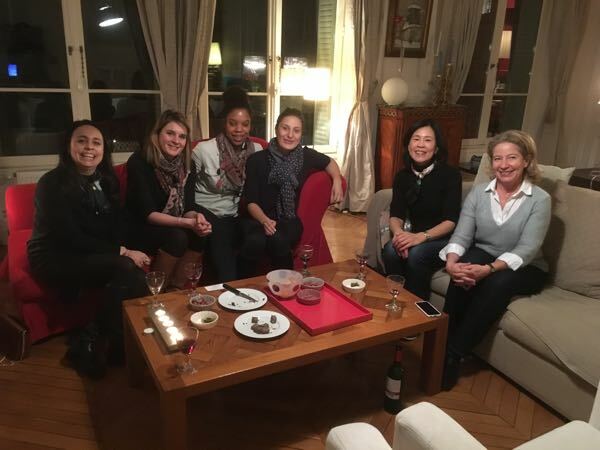 This week, I was able to join a group of 4 Parisians who had booked a dinner at the home of Odile and Pierre, who live in the 16th arrondissement of Paris (west side). Their apartment was absolutely gorgeous. It was what I envisioned a beautiful Parisian apartment would look like: spacious, high ceilings, and elegant. Odile and Pierre made me feel at home right away. Odile had asked VizEat what my level of French was and was told I could speak some French. 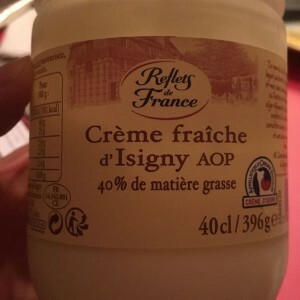 I did try to speak French as much as I could. I do wonder if I had given them the impression that I could understand and speak better than I really could because they (and the guests) spoke French quite often during the evening and I did not always “get” what they were saying. My experience was not typical of what an English-speaking guest would encounter. I was the only one out of 7 who didn’t speak fluent French but the hosts and guests did speak English with me often. My visit was last minute and arranged by VizEat and it was an opportunity to take part in a dining experience before I was to head home. Ordinarily, after you make a booking, the host contacts you to work out the details and to make sure that the mix will work for everyone (ie. language). 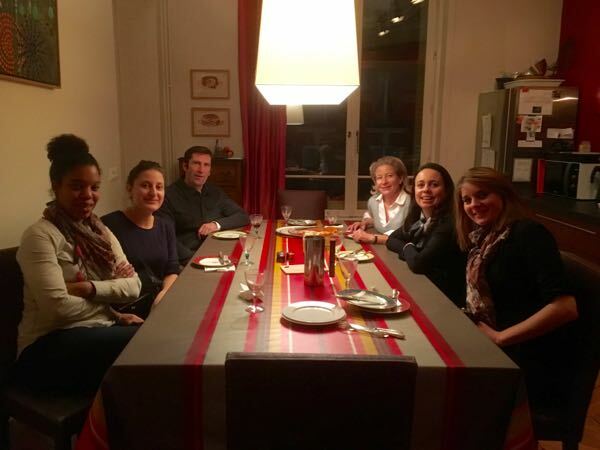 They frequently have a variety of dinner guests and are used to dealing with people who might not speak French. Hosts aim to have one language in common at the table. So, if you are concerned, don’t be. You will have no problem communicating at dinner. At dinner in the 16th arrondissement. I must say that Odile, Pierre and the 4 ladies from Paris could not have been friendlier. Over hor d’oeuvres and dinner, we engaged in conversation about such things as everyone’s background, travel, unique things to do in Paris, and cooking in general. We also got into a great discussion about French culture and the importance of travellers learning a few French customs such as saying “Bonjour” when entering an establishment. This is what makes the VizEat dining experience so unique: truly learning about the locals and the customs of the area. Dinner was delicious: red wine, classic Poulet à l’estragon (Chicken tarragon) with pasta and Tarte Tatin (apple tart) for dessert. There was lots of food and everyone had second helpings. [Thank you Odile for making TWO Tarte Tatins and having Crème Anglaise on the side!]. The entire evening lasted about 2 ½ hours and I would do this again in a heartbeat because it is unique and I love to learn about other cultures. You can’t always get that sitting in a restaurant. 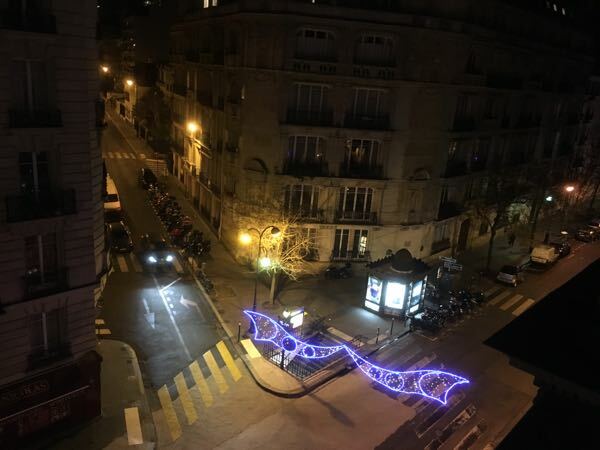 A big thank you to VizEat in Paris for providing this unique experience. As always, all opinions are my own. Oh what a perfect way to experience gastronomy in a local environment, with locals. 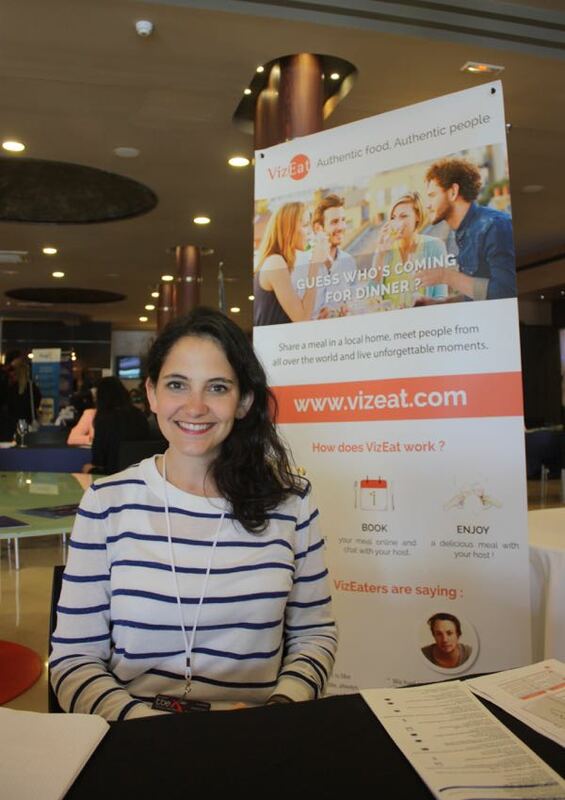 I hope VizEat expands to other European countries; I’m off to Portugal in March/April and would love a similar experience! Yes, it will be interesting to see where they expand to. What a lovely concept, I would have loved doing something like this in a city where I didn’t really know anyone. That meal looks delicious! OH i was! 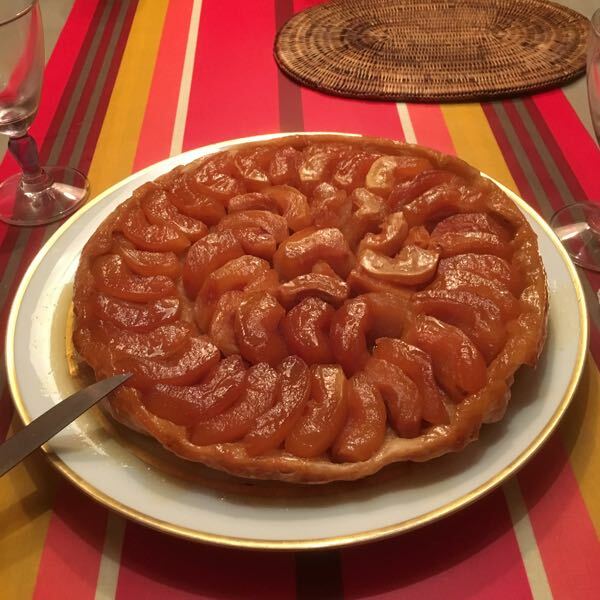 She made my favourite, all time dessert: Tarte Tatin! What a great idea and a terrific way to meet some locals as well as some travelers. The meal looks lovely and I can see why Tarte Tatin might be your favorite dessert. Mmmm! I could have had a whole meal of Tarte Tatin. Anything with apples! So glad that you had a wonderful experience with VizEat! 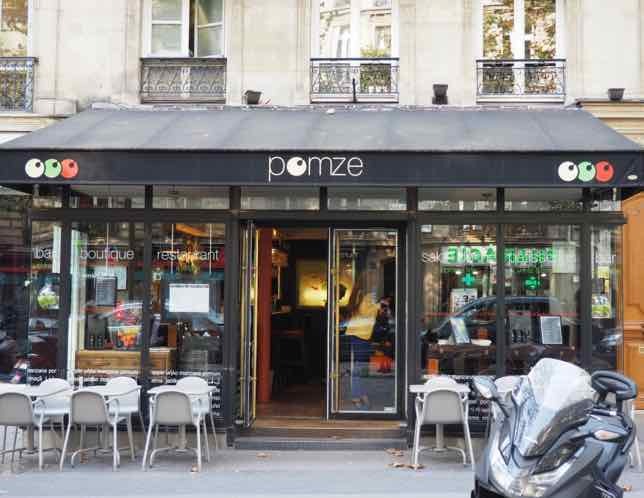 As you know, we had a dinner with VizEat during our recent visit to Paris and couldn’t stop raving about it. I love this concept and Jean-Michel and Camille have done a terrific job choosing the hosts that help spread the culinary culture of the destination you are visiting. I’d highly recommend VizEat too! What’s so funny is that when I arrived at their office, I met Jean-Michel and he had JUST received your email from you! I agree, he and Camille have done a super job. I can see why their business has been so successful. 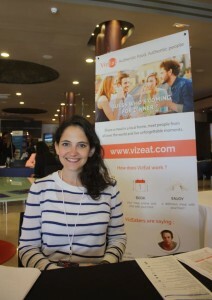 Somehow I missed VizEat at TBEX in Lloret del Mar. It sounds like an excellent concept. Sharing meals with locals is usually the highlight of any trip. 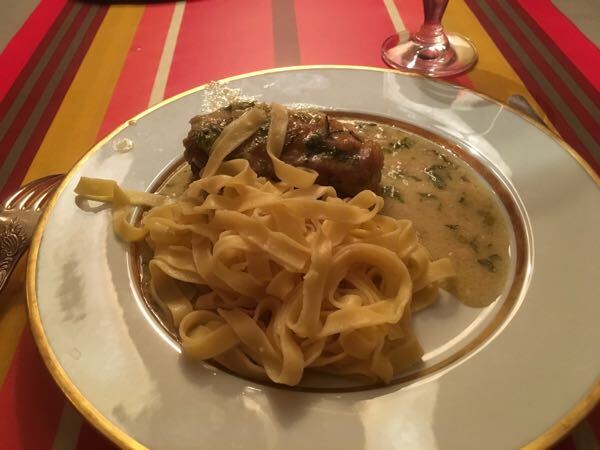 We’ve had family meals in France at the homes of French friends and when I went on a tour of Turkey, a home cooked meal on the itinerary was wonderful. We usually invite “foreigners” to share our family Thanksgiving dinner because of how much we enjoy dining at locals’ homes when we travel. I’ll definitely check out the VizEat website. That’s so nice that you do that at Thanksgiving. So different when dining with new folks and getting to know their culture. I’d love to try out vizeat. I’m almost compelled to do it myself…..ALMOST:-) I’ll have to delve into this further….Thanks for sharing! I never heard of VizEat — what a brilliant idea! Thank you for introducing me to it!! It would be so much more memorable and satisfying than a restaurant. They’re becoming more and more popular and it’s a great idea to get to know the locals more intimately!